For sixteen years, Sunn O))) have been challenging the way we think about music. In that relatively brief time, core members Stephen O’Malley and Greg Anderson have forged connections between the worlds of Metal, Drone, Contemporary Composition, Jazz and Minimalism with startling results while remaining true to the eternal principles of volume, density and weight. 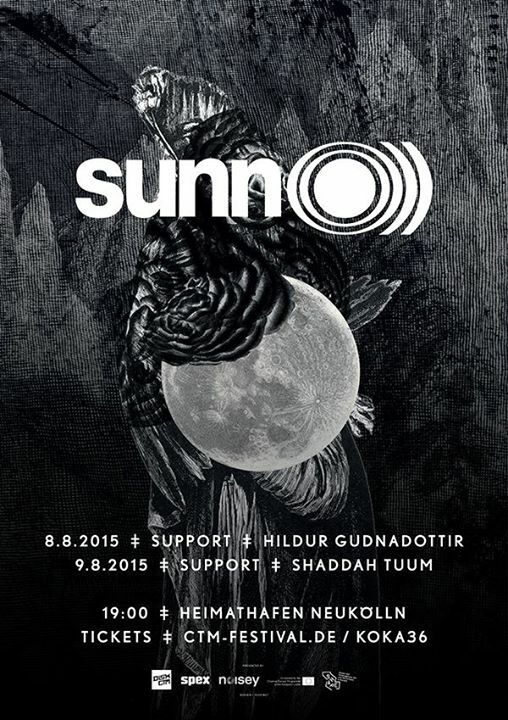 For this first of two Berlin shows, Sunn O))) will be supported by Hildur Guðnadóttir, an Icelandic cello player, composer and singer who has been manifesting herself at the forefront of experimental pop and contemporary music (e.g. with the band múm). In her solo works she draws out a broad spectrum of sounds from her instrument, ranging from intimate simplicity to huge soundscapes. Gudnadóttir began playing cello as a child, entered the Reykjavík Music Academy and then moved on to musical studies/composition and new media at the Iceland Academy of the Arts and Universitat der Kunste in Berlin. She has released four critically acclaimed solo albums, all on the respected Touch label, and has also composed music for theatre, dance pieces and films. The Icelandic Symphony Orchestra, Icelandic National Theatre, Tate Modern, The British Film Institute, The Royal Swedish Opera in Stockholm and Gothenburg National Theatre are amongst the institutions that have commissioned new works by Hildur. Among others Hildur has performed live and recorded music with Skúli Sverrisson, Jóhann Jóhannsson, múm, Schneider TM, Angel, Pan Sonic, Hauschka, Wildbirds & Peacedrums, Jamie Lidell, The Knife, Fever Ray, and Throbbing Gristle. Read our interview with Hildur Gudnadóttir here. Further information about the event here.